Ireland’s crucial fourth qualifying game of the Euro 2016 campaign is away to Scotland at Celtic Park – and we’ll be here minute-by-minute to follow it. Watch all the action on Aertv here, and download our app to follow it on the go. Scotland were full value for that win tonight in Celtic Park, as they brought more intensity and fashioned more chances than Ireland. Martin O’Neill and the team suffer their first loss in their Euro 2016 campaign tonight, and they can’t really have any complaints. Scotland passed the ball better, and really outmaneuvered Ireland in most facets of play. It was a physcial game, frantic at times, and Ireland’s defence held up very well to the onslaught throughout – and they nearly plucked an equaliser out of the blue in the last moments. Still, this was an important win for Scotland as they bring themselves back level on points with Ireland in Group D.
90+4 mins It’s coming towards the end here, and Ireland have one final effort to get forward… but there is the final whistle! 90+3 mins Last ditch stuff here from Ireland as Walters wins a free kick half way between the Scottish box and the halfway line. Brady takes it… and it hits the bar! It was flicked on by a Scottish head and it nearly goes in! Forde comes up for the corner… and it’s cleared by Mulgrew. Well. That was an incredible passage of play. 90+1 mins Ireland have possession on the right but can’t fashion a cross in. Scotland looking relatively comfortable as the ball trickles out for a goal kick from a poor cross. 89 mins Naismith takes his time with the free, and moves into the corner with it. Ireland eventually clear it, but Charlie Mulgrew wins another free for Scotland after a hefty challenege from Stephen Quinn. The Scottish players surround the referee, probably more as a time wasting gesture than any sort of indignation. 88 mins Scotland win a free near the Ireland box – and this will eat into the precious minutes Ireland have left to salvage a point here. 87 mins McGeady nearly gets a chance on the edge of the box, but just can’t control a pass in to him. Ireland are pushing hard here for the equaliser. 85 mins Ireland are putting together some bits of play in Scotland’s territory, but nothing too cutting edge as of yet. Ireland are pumping the ball long to Walters and he is doing well with some flick ons. 82 mins Ireland have a free kick on the right wing, and Brady puts it in deep. Hanley just gets it clear and out for a corner. A dangerous ball, though. A free out is awarded from the resulting corner as Keogh barges into Marshall as he collects the cross. 80 mins Scotland still doing well with possession, and not allowing Ireland to build any forward momentum. 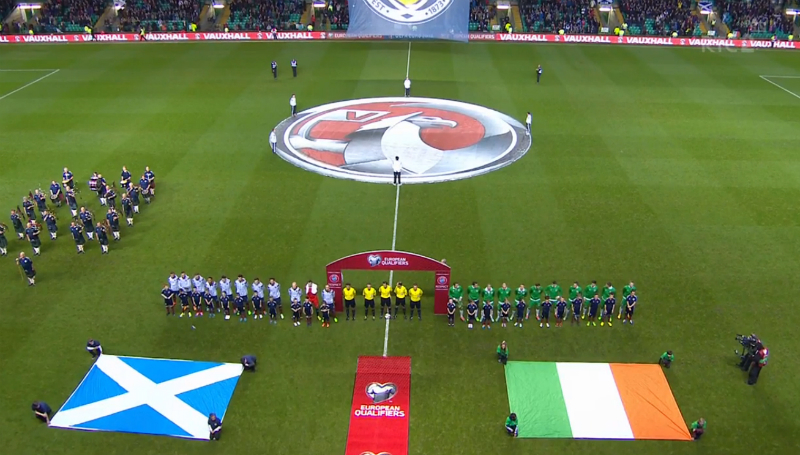 Which is worrying for Ireland if they are to take something from Celtic Park. Still, this team have a track record of getting late goals in Group D. Again? 78 mins Keane is on for Hendrick – so now Ireland shift to the 4-4-2 in a bid to salvage something from this fixture. But it’s Scotland that are on the attack again, with Hanley putting his header well wide. They are looking sharp and positive, even since the goal. 76 mins McGeady wins a corner for Ireland immediately. It’s Robbie Brady to take it… and Scotland clear it and go straight on the counter attack. Robbie Keane comes on for Ireland. Can he save Ireland one more time? Shaun Maloney curls it into the right corner! A well worked move from the corner – and some slack marking on Scott Brown in the box – allowed Maloney the space to curl in a beautiful finish. That was deserved for Scotland – and had been coming in all honesty. 73 mins Scotland win a free in a dangerous area on the right of the Irish box. Mulgrew looks set to cross it… and Walters flicks it off the crossbar and out for a corner! Well. That was extremely lucky for Ireland, and a great ball in by Mulgrew. 70 mins Roy Keane has got a talking to from the referee, following a decision awarded against Ireland that was pretty much incorrect. Roy is allowed stay on the bench – it was just a talking to. An intense, face-to-face talk. With Roy Keane. 69 mins Robbie Brady makes a brilliant run down the right and puts a cross in that is headed out for an Ireland corner. An immediate impact from the substitute there. 68 mins Scotland looking dangerous here. Anya’s cross eventually is too well hit, but they are moving forward with intent. Shane Long makes way for Robbie Brady and Gibson is replaced by Stephen Quinn. 66 mins What a miss by Scotland! Naismith breaks down the right and into the box, pulls it back to Martin who tries to put it back into the bottom right corner. It just misses past the post. A seriously close call there for Ireland. 64 mins The ball bobbles around the Ireland box dangerously, but O’Shea can get it clear. Another half chance comes for Scotland as Chris Martin puts a header well over the top. Is this game careering unstoppably towards a 0-0? Scotland look the more likely of the sides to break through anyway. 62 mins McGeady lofts a ball into the box, and Marshall takes it comfortably. Mulgrew goes up the other end, and the same thing happens with his cross. 60 mins The game has gone back into its scrappy phase again. It seems both teams are relying on long balls for forward movement – and the tactics aren’t working from either side. 57 mins McGeady has a fine left footed volley saved by Marshall. It looked like it was going right into the bottom corner. What an effort from the Everton man there, and an equally fine save. 56 mins Ireland seem to be trying to just slow things down a little here. Passing it a little more around the centre of the field compared to the first half anyway. Perhaps they are attempting to take some of Scotland’s spark that they showed in the first period. 55 mins Chris Martin replaces an injured Steven Fletcher. 53 mins Walters returns to the pitch. Ireland win another corner from a Coleman burst down the right. McClean takes it, and the ball goes straight up in the air from a defensive header. It eventually gets flicked towards goal by the head of Shane Long, and is caught by Marshall. That was a good chance for Ireland – probably their best of the night. 51 mins McGeady gets himself some space on the right and whips a lovely ball into the box. Walters gets his head on it but it’s deflected over for a corner. Great play from McGeady for, it has to be said, the first time tonight. Marshall cleanly catches the resulting corner, and Walters has gone off to receive treatment for a blood injury on his arm. 50 mins A long ball nearly works out well for Walters. Ireland are looking a little more positive so far in this second half, but still no link up play of note. 48 mins A slow start to the second half by both teams. Shane Long gives away a free when he unceremoniously barges over Mulgrew in midfield. Looks like it will be more of the same, then. 46 mins And we’re back – and so are the teams, exactly as they left us. Ireland work it up the right wing early on, like they did in the first half. They have multiple throw ins, but fail to get the ball into the box. And that’s half-time at Celtic Park. Ireland started off brightly but lost their way going forward after about ten minutes. Scotland have put consistent pressure on the Irish defence, and even created some good chances for Fletcher up front. Ireland have faced up to the challenge very well defensively. The game has been played with an intensity not often seen in international football – but perhaps lacking the skill and guile you might expect. What can Ireland do differently? We’re all set up for a fast, physical and frantic second half – and the atmosphere in Glasgow has not let up for the 45. We’ll be back soon. 45 mins Ireland try to come forward, but Walters pass to Long is not collected cleanly. It’s been the story of Ireland’s half so far, really. 43 mins Scotland again make ground down the left wing, but McGeady eventually takes the ball from Anya and Ireland get it clear. Another half chance gone for Scotland. 41 mins Maloney fashions a brilliant chance for Fletcher who just can’t connect with the cross. Maloney centred it wonderfully, and the Scottish striker should have done better. Maloney’s original takedown was almost Bergkamp-esque. 39 mins Whittaker has a weak effort saved by Forde. Still so much Scottish pressure on the Irish goal. Eventually Ireland put together an attack and Walters can’t quite get his head on a cross properly – sending his header looping high and wide. 37 mins Walters takes a long ball down on his chest and attempts a rather audacious volley from well out. It goes far wide, but Walters has proven to be a crucial outlet tonight so far – and Ireland are needing one more and more. 35 mins Scotland are peppering Ireland’s box with crosses now. Ireland’s defence is under siege, but survive the onslaught eventually and get the ball into the Scotland half. That was relentless attacking by the Scots there. Walters goes up the other end and wins a corner to relieve the pressure. 33 mins Naismith does brilliantly on the edge of the box – dribbling into some space. The ball is finally whipped in and Mulgrew’s header goes just wide. That was the best play from either side so far. Dangerous. 31 mins James McClean is the next to commit a needless foul. He doesn’t get booked, but the referee might want to calm this game down. 29 mins It’s getting a bit tasty out there. Hendrick crunches into Whittaker in the midfield. It was high and it was pretty reckless. A yellow for Hendrick, and Whittaker is receiving treatment. This one isn’t for the faint hearted. 27 mins Scotland win a free all the way out on the left wing. Mulgrew puts it into the box, and when Forde comes to take it Hanley goes up with what looks like an elbow. Hanley is already on a yellow – and that could have been a second. 25 mins Long wins another header up front, but the resulting play comes to nothing as Walters loses the ball on the edge of the Scottish box. 24 mins Anya is looking dangerous down the left wing for Scotland. McGeady is dispossessed again in the middle of the field when trying to run it out from the back. 23 mins McGeady puts in a great sliding challenge near the Ireland box – risky given he is on a yellow – but it is timed nicely. 21 mins Scotland make progress up the right wing and win a corner from a Naismith cross. 20 mins Some really scrappy stuff here. John O’Shea is upset that Naismith threw an elbow when going up for the ball with him. We’ll wait to see a replay on that one – but he looks unhappy. 19 mins An over hit Whittaker cross is just kept in by Robertson on the left. Nothing comes from his eventual cross. 18 mins McClean puts in a decent near post cross from the left wing, but there was no Irish forward making that run. Some scrappy play from both sides in the last ten minutes has somewhat taken the early bite out of the game. 16 mins Maloney whips in a free kick from the right wing, and John O’Shea gets a clearing header on it. No clear cut chances as of yet. 14 mins Ireland have been slightly sloppy in possession so far. McGeady picks up the game’s first yellow with a mis-timed sliding tackle. 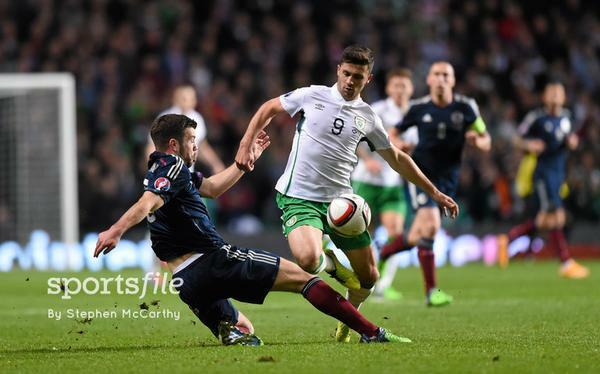 12 mins Scotland’s centre back Hanley mis controls the ball at the back and Shane Long nips in to take it away. Just as he knocks the ball through, Hanley takes him out. Free kick given, but should that have been a red card? Long looked like he was clear through on goal. Yellow is the decision, though. 10 mins Long wins another couple of headers and nearly puts Walters clear through. Gibson has a volleyed effort from outside the box that dips nicely into Marshall’s arms in goal. It’s nip and tuck here. 8 mins Ireland have a few shaky moments at the back, but they didn’t give any chances away. Long is putting himself about up front quite a bit, and has already won a couple of balls up there. Maloney and Naismith pass it nicely around the edge of the Ireland box – but Maloney’s effort trickles wide. 6 mins McGeady gets the ball on the right wing for Ireland, but is dispossessed by Robertson to the glee of the home fans. 5 mins Robertson breaks down the left wing for Scotland and puts a fizzing ball into the box. Fletcher gets a boot to it but it goes over. High octane stuff at Celtic Park so far. 4 mins Scotland whip a ball in and Ward takes the safe option and heads it away for a corner. Maloney takes it and Fletcher gets his head on it – a free header – but it goes over. A great early chance for Scotland there. 2 mins Walters has the first effort of the match. Good interplay with Shane Long up front, and Walters cleverly makes room for himself and gets a low shot in. Comfortable save by Marshall though in the Scotland goal. 1 min Walters wins a free kick in a dangerous position on the right of the box. This is an instantaneous chance for Ireland to put some pressure on the Scottish defence… McClean hits it straight into the wall. Chance gone. 19:39 George Hamilton describes the atmosphere as a “celtic family outing” – which sums up the unique nature of this local derby-type fixture. 19:32 The consensus of the RTÉ panel (Brady, Sadlier and Dunphy) is that the Robbie Keane ommission is probably the right decision, given the nature of the fixture tonight. A high intensity atmosphere at Celtic Park will require Shane Long to run the channels and hold the ball up well. Contrary to the official UEFA formation below, most agree that Long will be up top in the lone striker role, with Walters on the right wing. Whether that will happen or not, we will see. 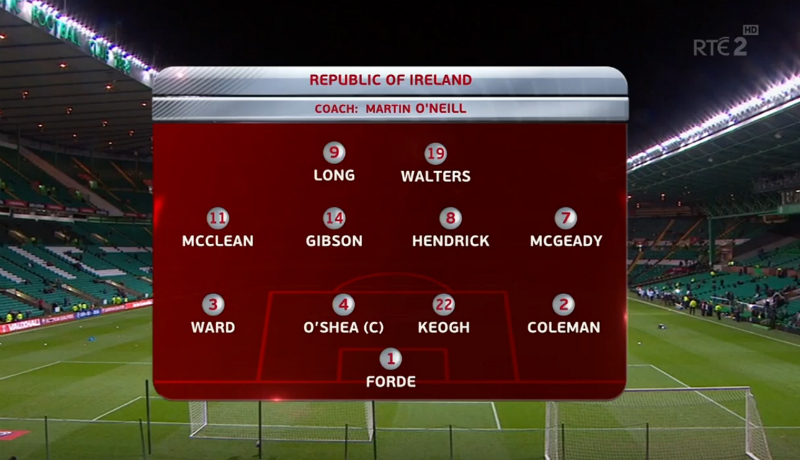 If Ireland are playing two up top, then the decision to leave Keane on the bench is an even bigger one.